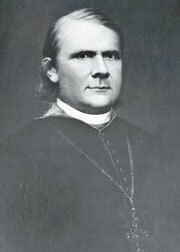 Andrew J. Byrne arrived in Little Rock on June 4, 1844, as the first bishop assigned to the frontier state of Arkansas. 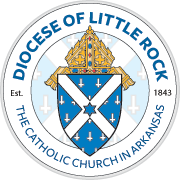 Pope Gregory XVI had established the Diocese of Little Rock on Nov. 28, 1843. Two months earlier, then-Father Byrne, pastor of St. Andrew Church in New York, had been told of his appointment to shepherd the new Arkansas See, which included for a time the Indian Territory west of Fort Smith. The native of Navan, Ireland, brought two New York priests with him to Arkansas. They encountered a largely undeveloped land most recently served by Lazarist missionaries and the Sisters of Loretto. This was more than 300 years after the Spanish explorer, Hernando de Soto, erected a cross west of the Mississippi River near present-day Helena-West Helena. Bishop Byrne cut an imposing figure and was blessed with a rich, powerful voice. He worked quickly to establish parishes at Little Rock, Pine Bluff, Arkansas Post and New Gascony in his first year. He ordained his first diocesan priest at St. Ambrose Church, Arkansas Post, in 1845 and dedicated the first Cathedral of St. Andrew the next year at Seventh and Center streets in Little Rock. The bishop introduced the Sisters of Mercy to the diocese in 1851. Also that year, he opened a college for boys in Fort Smith, which at the time served as an edge-of-the frontier supply depot for the U.S. military. The sisters occupied a convent in Fort Smith, where they also operated the first of three parochial schools in the state. The other two opened later in Little Rock and Helena. A countryside beset by sickness, slavery, lawlessness, and waves of anti-immigrant, anti-Catholic sentiment — best personified by the Know Nothings — combined to defeat Bishop Byrne’s larger purposes. He had hoped to settle an Irish colony in Fort Smith but a pilgrimage of 75 families whom the bishop recruited in 1849 was plagued from the start by a difficult ocean voyage, cholera and, ultimately, general disenchantment with their new surroundings upon arriving in Arkansas. Some went to St. Louis, some to Little Rock and some completed the trek to Fort Smith. The bishop eventually abandoned the colonization plan. Other difficulties arose. A forest fire destroyed the cypress lumber gathered for construction of a permanent college building in Fort Smith in 1853. A blaze of more-suspicious origin destroyed the Catholic Church in Helena in 1854, as the Know Nothings’ influence strengthened. A Civil War was coming and the bishop realized the diocesan property in Fort Smith was destined for use as soldiers’ camps. Bishop Byrne died June 10, 1862, in Helena and was buried in the Sisters’ garden. He left a diocese of maybe 1,000 Catholics served by nine priests. Arkansas would be without a bishop for nearly five years. In 1881, Bishop Byrne’s remains were taken to Little Rock and placed in a crypt under the sanctuary of the newly dedicated Cathedral of St. Andrew at Seventh and Louisiana.